Mango rice recipe - Raw mango rice prepared using masala bhath powder is an exotic, flavourful one pot meal, goes well with any raita or salad, pickle and papad along with butter milk. The similar type of rice can be prepared using carrots, onion, tomato, mint leaves or pudina, paneer, peas and mixed vegetables such as beans, cauliflower and tindora. 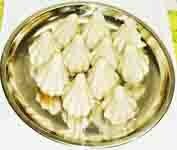 If you don't like to add masala bhath powder, skip it and follow the remaining process. 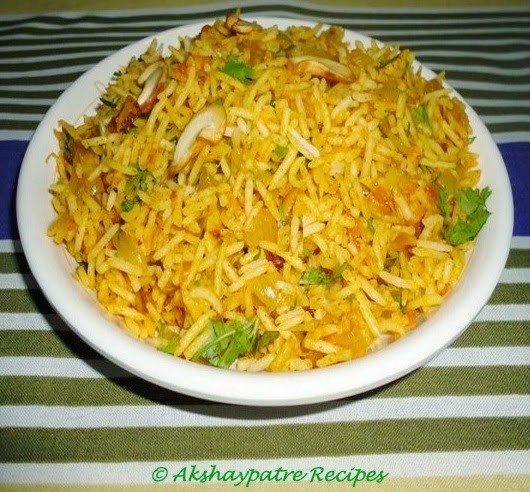 This is one of the easiest methods of preparing the mango rice. 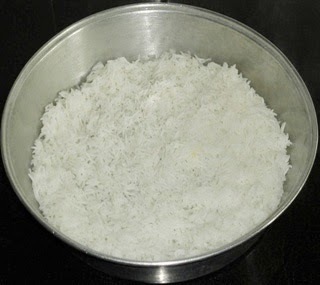 Wash the rice thoroughly and soak it in the water for 20 minutes. Drain the soaked rice and add 7- 8 cups of water and salt. Cook it on a medium flame till the rice cooks well. 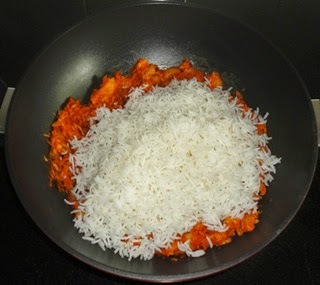 Drain the rice and spread it on a plate. Heat ghee in a pan. Add jeera and chopped green chili in it. 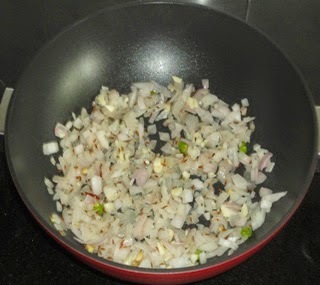 Add the chopped onion, crushed garlic and ginger. Fry till the onions are translucent. Now add the masala bhath powder, garam masala, chili powder and turmeric powder. Saute for a minute. Add grated mango and salt. Mix well. Cook covered on medium flame till the raw mango cooks well. When the mango cooks well, remove the lid. Add the cooked rice and mix well . Again cover it with lid. 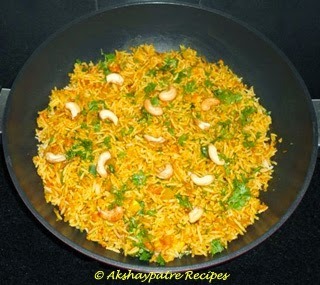 Cook the mango pulao on low flame till the rice gets substantially hot. When it is done, remove from the flame, add chopped corianders and mix gently. Mango pulao is ready to serve. Garnish with roasted cashew nuts. In the last step You can place an iron tawa on a medium flame and keep the pan with mango rice over it for about 5 minutes or till the rice gets quite hot. 2. Heat ghee in a pan. Add jeera and chopped green chili in it. Add the chopped onion, crushed garlic and ginger. Fry till the onions are translucent. 3. 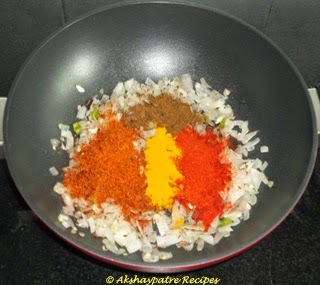 Now add the masala bhath powder, goda or garam masala, chili powder and turmeric powder. Saute for a minute. 4. Cook covered on medium flame till the raw mango cooks well. When the mango cooks well, remove the lid. 5. Add the cooked rice and mix well . Again cover it with lid. 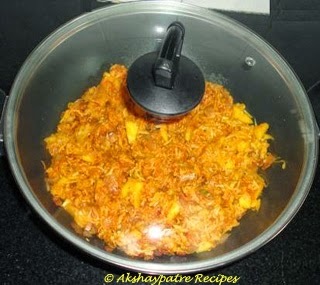 Cook the mango pulao on low flame till the rice gets substantially hot. 6. When it is done, remove from the flame, add chopped corianders and mix gently. Garnish with roasted cashew nuts. 7. Serve the mango rice hot with choice of your side dish. very delicious and yummy dear, so many mango dishes. Just the name made my mouth water, tangy & delicious rice! yummilicious and awesome raw mango rice. Great blog! well explained..would love to try it.